VICTORIA (U SPORTS) – Danielle Boiago, a fifth-year guard from the McMaster Marauders, was named the 2017 U SPORTS Women’s Basketball Player of the Year, Wednesday night. Boiago, a Kinesiology student from Hamilton, Ont., is the first Nan Copp Award (Player of the Year) recipient from the Marauders. Other U SPORTS award recipients announced during the All-Canadian Awards were Winnipeg guard Antoinette Miller, Defensive Player of the Year; Regina guard Kyanna Giles, Kathy Shields Award (Rookie of the Year); Queen’s bench boss Dave Wilson, Peter Ennis Award (Coach of the Year); Acadia forward Katie Ross, Sylvia Sweeney Award (Student-Athlete Community Service); and McMaster guard Vanessa Pickard, Tracy MacLeod Award (Courage Overcoming Adversity). The 2017 ArcelorMittal Dofasco U SPORTS Women’s Final 8 gets under way Thursday, March 9 at the University of Victoria. Semifinals will be airing live on Sportsnet 360 and SN NOW on Saturday, March 11th at 5 p.m. and 7 p.m. ET, with the finals airing Sunday, March 12th at 4 p.m. ET. 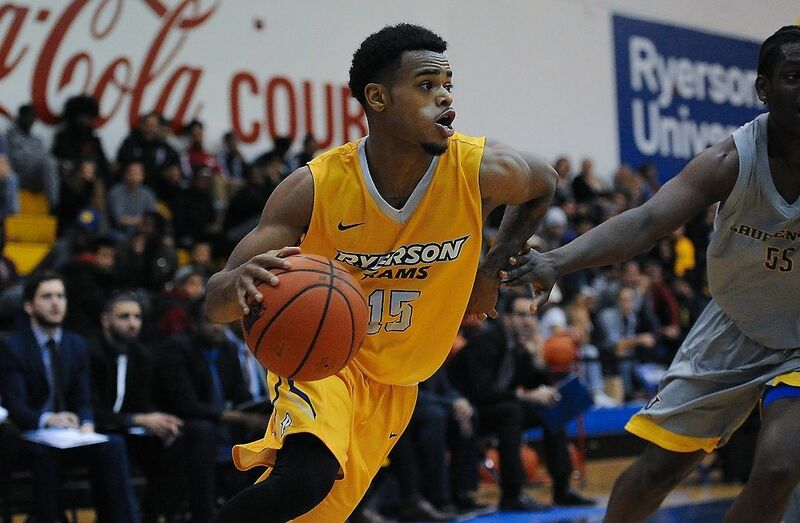 The rest of the tournament will be available for online streaming at USPORTS.LIVE. 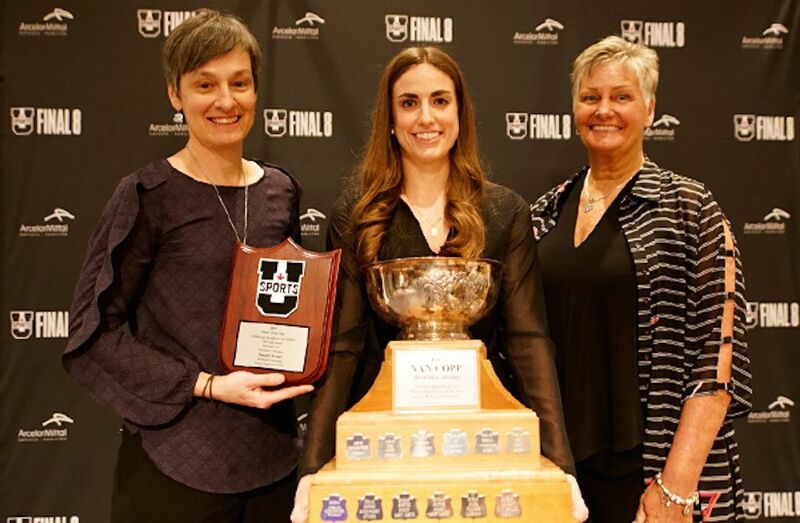 Danielle Boiago signalled her potential in her rookie season, winning the OUA West Rookie of the Year Award in 2013 and being named to the U SPORTS All-Rookie Team in the process. She has been an OUA all-star in each of her four subsequent seasons, reaching the Second Team in 2014, and cracking the First Team for three consecutive years. In 2017, she became just the fourth player to win both the OUA Player of the Year and Defensive Player of the Year awards, and the first Marauder to accomplish the feat. Boiago was the first McMaster player to win Player of the Year since Lindsay Degroot repeated as the winner of the OUA West honour in 2007 and 2008, and the first Mac winner of the Defensive Player of the Year since Rachel Hart in 2008. Boiago’s rate of 25.5 points per 40 minutes was the highest in the OUA this season, while her totals of 81 assists and 51 three-pointers ranked third in the conference. She completed her regular season career as McMaster’s all-time leading scorer, with a total of 1,719 points that ranks third in OUA history. She also topped the record book with 250 steals, and finished second in assists (297) and third in rebounds (603). Boiago becomes McMaster’s first winner of the Nan Copp Award. The other nominees were guards Antoinette Miller of Winnipeg, Jane Gagné of Laval, and forward Alison Keough of Cape Breton. Antoinette Miller of the University of Winnipeg Wesmen is the 2016-17 recipient of the U SPORTS Women’s Basketball Defensive Player of the Year. The 5-foot-6, fourth year guard from Phoenix, Arizona finished among the league leaders in both offensive and defensive categories during the 2016-2017 Canada West regular season. 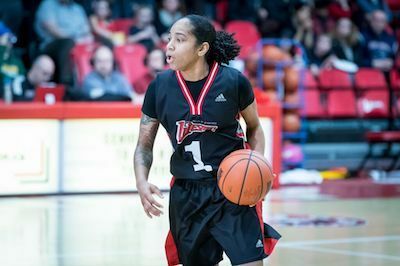 Her relentless play at both ends of the court played a vital role in helping the Wesmen finish with an 18-2 regular season record and a first place finish in the Canada West Women’s Basketball conference standings. 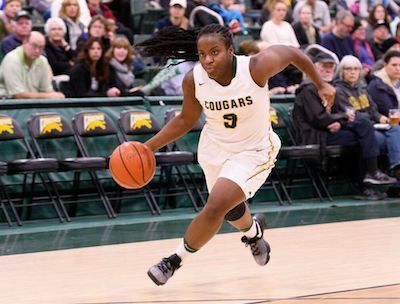 She finished regular season play with 72 steals (third in the country) and was instrumental in Winnipeg’s suffocating defensive play that allowed 60.7 points per game, while holding the opponents to 37.6 per cent shooting from the field. Miller was also a force on the offensive side of the ball, finishing the season fourth in the nation averaging 18.7 points per game and first in Canada West assists with 76. The other nominees were guard Danielle Boiago of McMaster, centres Alex Kiss-Rusk of McGill, and Katelyn Mangold of UNB. Kyanna Giles earns U SPORTS Rookie of the Year recognition after turning in a sensational season for a University of Regina team that will head into this weekend’s national championship as the No. 5 seed with a 32-4 overall record. Giles finished second on the Cougars in scoring with an average of 12.9 points per game and also had a team-leading average of 7.3 rebounds per game while leading Regina in steals during the Canada West schedule. She eclipsed the 20-point barrier on three occasions in conference play, including a season-high 25 points in a win at Brandon. Also named a Canada West third-team all-star this season, Giles joins Andrea Gottselig (1996) as the only players in U of R history to earn the Kathy Shields Award as the U SPORTS Rookie of the Year. Giles, who’s enrolled in the Faculty of Arts, starred for Sisler High School in Winnipeg before coming to the University of Regina. She was named the top high school player in Manitoba by the Winnipeg Sun in 2014, 2015, and 2016. The other nominees were guards Jenna Mae Ellsworth of UPEI, Kayah Clarke of Windsor, and Caroline Task of Concordia. Dave Wilson is the first Queen's coach to receive the Peter Ennis Award since the trophy was initiated in 1977-78. 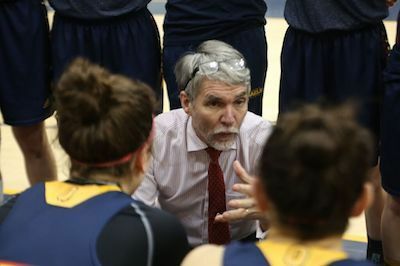 In his 35th year as head coach and 36th with the program, Wilson guided the Gaels to a team-best 18-1 record in conference play, finishing with a silver medal in the OUA final on home court in Kingston. The team also reached a program high in the national rankings, rising to the No. 3 spot in the coaches’ poll. Queen's had one of the best defensive units in the country, averaging a national-best 12.4 steals per game while limiting opponents to shoot just 23.5 per cent from beyond the arc, good for second in the country. Wilson is a four-time recipient of the OUA coach of the year award and sits at 352 career wins heading into the Final 8. Over his 36 years with Queen's, Wilson has produced a 100 per cent graduation rate for his student-athletes. The other nominees were Guillaume Giroux of Laval, Tanya McKay of Winnipeg, and Scott Munro of Saint Mary’s. Fourth-year Acadia Axewomen guard Katie Ross is the 2016-17 recipient Sylvia Sweeney Award for student-athlete community service. The kinesiology student from Bedford, N.S., is a four-time academic all-Canadian. She volunteers her time with the Annapolis Valley Cardiac Rehabilitation Centre and is heavily involved in the Kinderskills and Rec Buddies programs. Ross is also involved with Acadia's S.M.I.L.E. program (Sensory Motor Instructional Learning Experience), working with children with autism to develop motor, cognitive and social learning skills. On the court, Ross started in 16 games for the Axewomen this season, averaging 8.3 points and 5.1 rebounds per game. She is also one of AUS's few dual student-athletes, as a member of Acadia's women's soccer team. “Katie is an exceptional candidate for the Sylvia Sweeney Community Service award," said Axewomen basketball head coach Len Harvey. "She is the most remarkable student-athlete I have coached in my time as an assistant or head coach at this level. 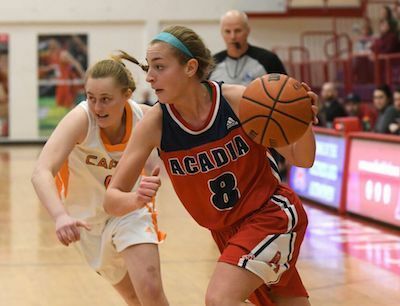 "She somehow manages to be a dual-sport athlete, excelling and starting for both the basketball and soccer teams at Acadia, maintains a perfect 4.0 GPA in a difficult academic program, all while volunteering more than anyone else on our team. She is one of the main leaders in our locker room, and is a friend to everyone she meets." Ross becomes just the second AUS winner of the award, following Dalhousie’s Ainsley MacIntyre last season. The other nominees were forward Jennifer Silver of McGill, guards Nicole DiDomenico of Ryerson, and Jenna Krug of Victoria. Pickard began her career with the St. Francis Xavier X-Women, being named the U SPORTS Rookie of the Year in her first year with the program in 2012. Following an injury-plagued sophomore season, Pickard played her junior year with the X-Women before deciding to sit out and finish her undergraduate degree. 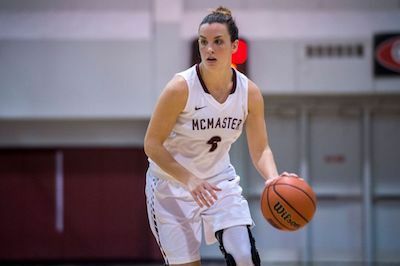 Accepting entry into McMaster’s Master of Kinesiology program in 2015, Pickard returned to the court for her fourth year, joining the Marauders. But a knee injury suffered in non-conference play forced the guard to miss the entirety of the regular season and playoff schedule. Due to return in the fall of 2016, Pickard suffered a string of setbacks that held her out of the lineup until the Christmas break, when she returned to help the Marauders to a title at the Thunder Selects tournament in Halifax. She completed the OUA regular season with 12 appearances and displayed her offensive efficiency, posting an average of 23.8 points per 40 minutes that ranked fourth in the conference. Pickard becomes the second Marauder to claim the Tracy McLeod Award, joining alumna Rachel Hart, who was honoured in 2008. The other nominees were guard Jane Gagné of Laval, forwards Paige Thomson of Victoria, and Brooklynn Wright of Memorial.